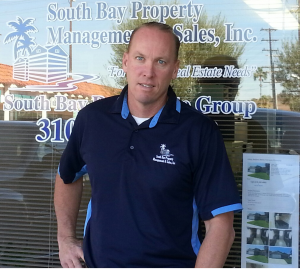 Owner, Tim Kelley of South Bay Property Management & Sales, Inc (a division of South Bay Real Estate Group) was born and raised in Manhattan Beach and now resides in Torrance with his wife Jennifer and their two children, so he knows this area as only a lifelong resident can. Tim has over 20 years experience as a real estate broker and property manager in the South Bay, so you’ll have piece of mind knowing that your investment is in good hands. Tim is a full service property manager for both residential and commercial properties, from complete care of your property to simply collecting the rents, he gets the job done right the first time. He also offers professional and reliable real estate services throughout the South Bay and surrounding areas. Call Tim Kelley of South Bay Property Management & Sales, Inc today at (310) 561-8883 for your free “no-obligation” property management consultation or to just ask him a question, he’s more than happy to help!